Isearch operate Uganda's largest document scanning services. Using our sophisticated high speed duplex scanners we have a capacity to scan over 50,000 pages per day into most formats including TIF, PDF, JPG and many more. Our scanners can handle B+W, colour and any size up to 36" wide and all scanning work is accomplished using Kofax Capture combined with VRS image enhancement software to guarantee the best quality images from even the worst quality originals. 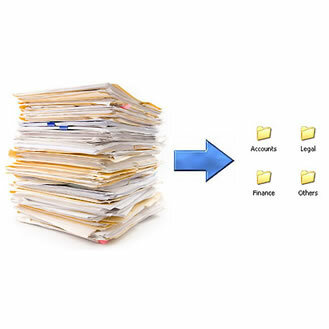 Scanning your documents into digital form can bring you many benefits. Whether you have invoices, project files, correspondence, books/magazines, purchase orders or other documents to scan we can recommend the best way to do it and finish the job quickly, to a high quality and at a low cost! Typically you can store 3 filing cabinets of information on one CD ROM thereby saving thousands of pounds per year on document storage space. According to a Gartner consultants survey, a typical office worker can spend around 40mins every day in finding documents upon which they perform their business tasks. A document management solution, in conjunction with scanning your documents, will cut this time at least in half. Therefore a department with 20 staff could save over 250 hours in time per month. At a cost of say £10 per hour this equates to £2500 saving per month per 20 staff! Businesses today should have contingency plans in place to cover the catastrophic loss that could happen as a result of flooding, fire, terrorism or other disaster. Most companies have regular tape backups of their electronic data but what about backups of all your paperwork? A recent report indicated that companies which suffered a major loss of information due to fire typically went out of business within 12 months. Document scanning and archival enables you to have multiple copies of your documents on and off-site and these can be re-instated within minutes of any disaster so staff can carry on their work. Quality control is a priority! Isearch is the only Ugandan approved contractor for the provision of scanning services to the Home Office, MOD and National Archives. You don't want to be QA checking your suppliers work so make sure you can TRUST who scans in your documents to the high standards you expect! Once scanned we can return the documents on CD-ROM in our document search/viewing database or alternatively we can load your documents into our Filestore online service for secure password protected access anywhere in the world. Documents can then be searched for on a number of user definable fields which means a single document can be located and viewed in under a second.